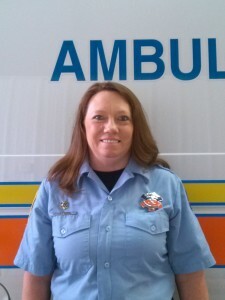 Pafford EMS of Oklahoma is proud to nominate Kim Poindexter as an American Ambulance Association 2016 Star of Life. Kim has been a very loyal and productive employee both on and off the truck. Kim began her EMS career 12 years ago after watching a close friend pass away before her eyes, unable to provide any assistance. She decided at that moment that she never wanted to be in that position again, and enrolled in the next EMT course she could find. For 12 years, Kim has served the citizens of Sequoyah County, Oklahoma, the past 10 of which have been with Pafford EMS of Oklahoma. In those ten years, Kim has proven to be an invaluable asset to both the company and her peers. Most EMS providers look at their peers in EMS as an extension of their immediate family, and Kim is hardly an exception. She often takes this family approach to unforeseen levels. Kim goes out of her way to ensure the crews who are working on holidays are invited to her home to enjoy a warm holiday meal and fellowship with her family. Whenever her peers face difficult times, on either a professional or a personal level, Kim has always been the first person to come to their aid, offering them any support she can provide, whether it be a shoulder to cry on, a warm meal, or just simply letting them know that she cares. When natural disasters strike, such as widespread wild-land fires, or tornadoes, Kim always rushes to the aid of the front-line personnel, firemen, or first responders. She has been known to purchase pallets of bottled water and cases of snacks, and to deliver them to these responders to ensure they have some simple necessities to continue their work. Kim has always been the kind of EMT that takes her peers into consideration, often volunteering to take emergency calls, inter-facility transfers, or posting assignments, just so other crewmembers can catch a break, or get something to eat. Kim has always strived for excellence in everything she does. She is passionate about her job and peers, compassionate with her patients, and is a model person and employee.